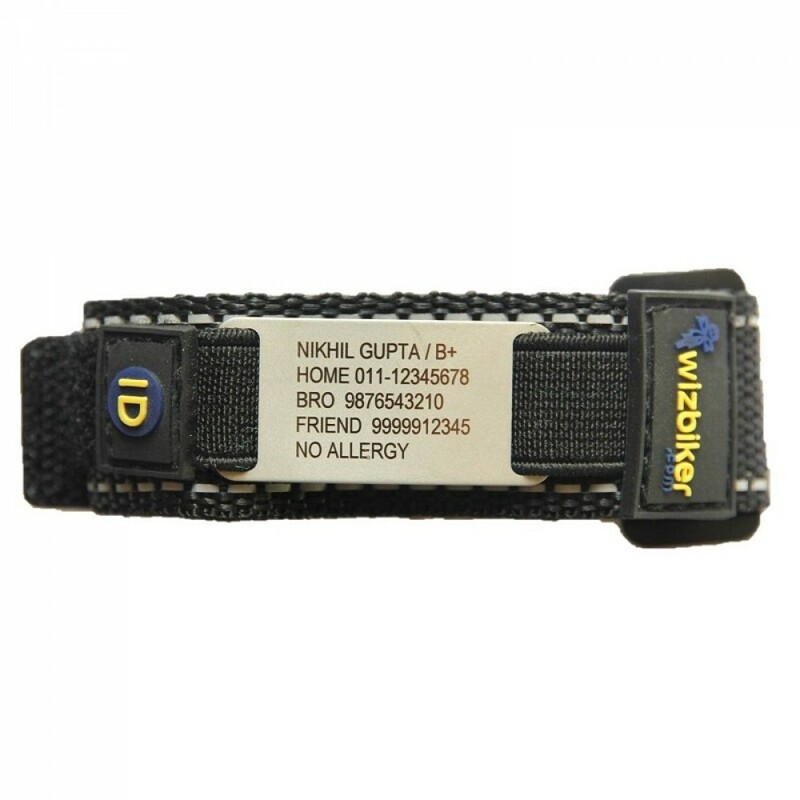 wiz ID FIT is made up of highly durable nylon band with a Velcro strap adjuster and a steel tag with all your emergency contact information laser etched on it. The reflective detailing enhances visibility in low-light conditions. The steel tag can accommodate 5 text fields worth of important emergency contact information, which will be provided by you. The same information will be used to contact your relatives, will act as your saviour in case you have an unexpected event during the run, ride or hike or other adventurous sports activities you’re a part of. 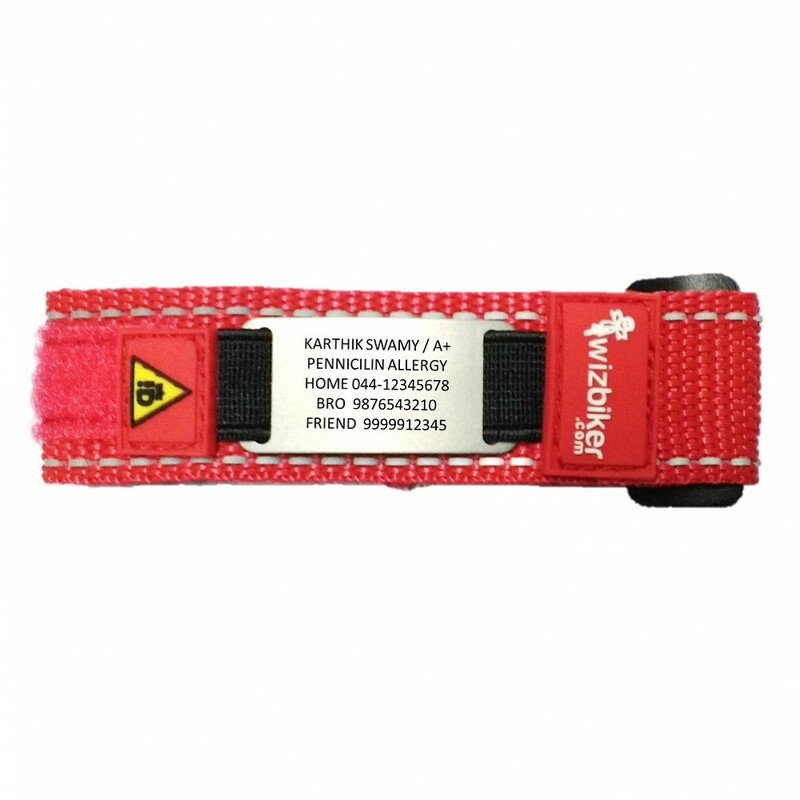 Name, blood group, age, contact information of family/relatives who you think will be able to act quickly in dire circumstances, any allergic reaction or any other equally important information which you think the first responder should know about you would be nice to have laser etched on your wiz ID band. Above, you’ve 5 text fields (each field can accommodate 20 characters maximum) worth of space to jot down all your emergency contact information. To extend a helping hand, there’re hints given in each line to help you fill the emergency contact information along with the few sample of wiz ID FIT emergency band photos included on the product page. How to personalize the wiz ID band? 1. Select your preferred wizID band colour. 2. Fill in your ID Tag content as per the guidelines given below. Line 1 :- You can choose to write your name or blood group in the first field. Line 2 :- In the second field, you may choose to highlight your city, date of birth or the community, group you usually ride/run with. Line 3 :- Family member name along with the working contact information. Line 4 :- Contact information of your family/friend/relative. Line 5 :- You may choose to fill this field with another emergency phone contact number, motivational quote or a group/club name. Please treat these as a guidelines to personalize the wiz ID band, you may, however choose to personalize your wiz ID band as per your liking. Note:- What you type is what you get. All the text will be changed to UPPER CASE and center aligned by us. Note:- We’ll treat the information provided by you final(and correct) before processing your order. Please ensure that the information provided by you is 100% correct. 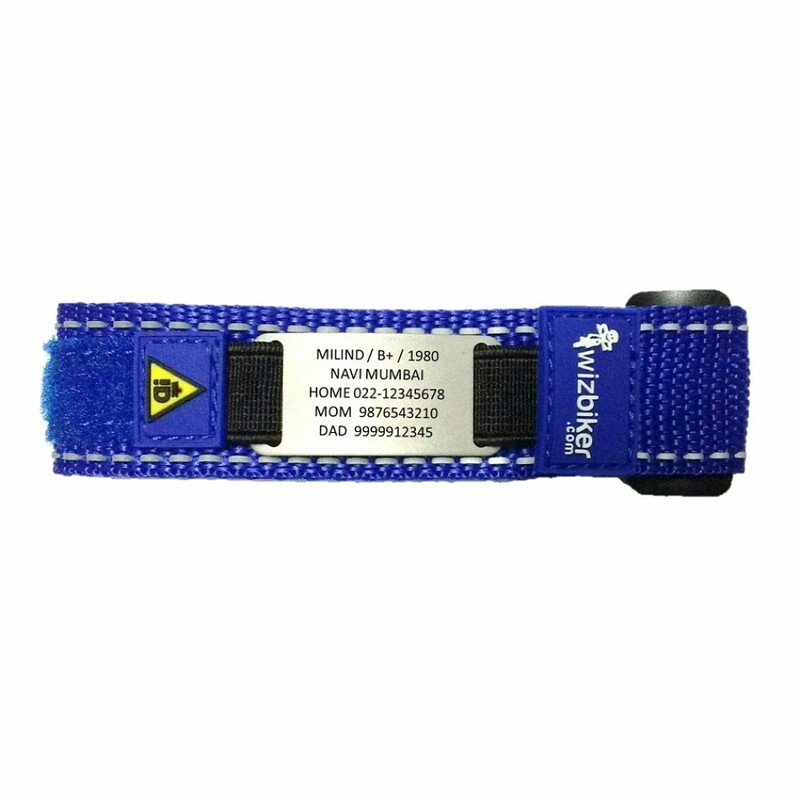 It’s a sports ID bracelet for sportsperson like you with all your emergency contact information you wear when you go out for a ride, run, hike or spend time outdoor. 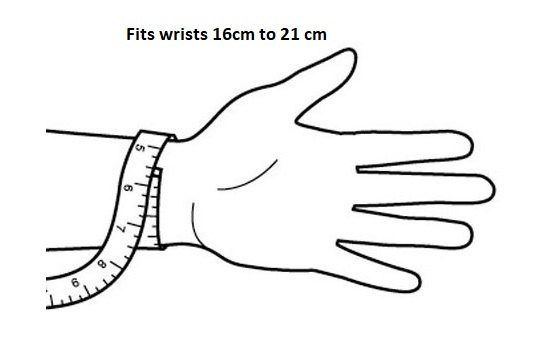 At wizbiker.com, you’re free to choose from three different wizID bands – wizID SLEEK, wizID SMART, and wizID FIT. 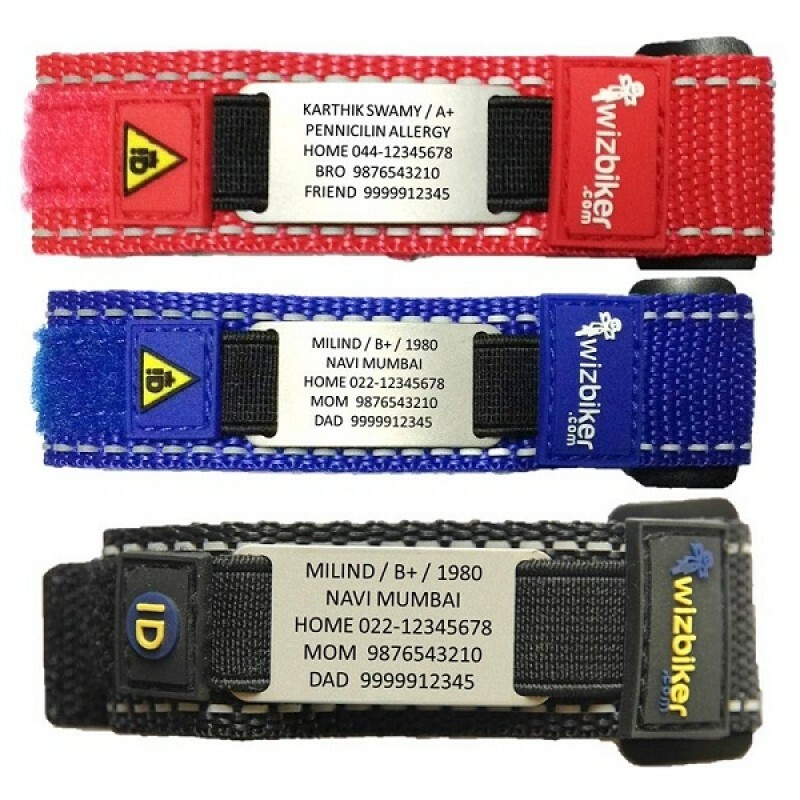 All the three wizID band come equipped with a band and a tag with all your emergency information laser etched on it. wizID SLEEK is just a silicone-nylon band and a tag with your emergency information laser etched on it. Whereas wizID SMART(available in five colors) come equipped with a buckle closure(like a wristwatch) and a tag with all your emergency information. Where wizID FIT is made up of high-quality nylon band come equipped with a Velcro strap adjustment which makes for a snug fit and a tag for all your essential information. About Schwalbe Black Jack MTB Bike Tire 50-559 (26 x 2.0)If you’re a beginner, interested in occ..
SKS Topcage Water Bottle StandSKS Topcage water bottle stand can accommodate all kinds of plasti..
SKS Longboard Road and Hybrid Bike Mudguard Silver, 45mmMost road, hybrid or mountain bikes come..
SKS X Blade Rear Mountain Mudguard 26”, 27.5″, 28″ or 29″With quick-release mounting technique, ..
wizID SLEEK Bandwiz ID SLEEK is made up of extremely durable silicone band and a steel tag with ..
wizID SMART Bandwiz ID SMART band is made up of highly durable silicone band with a buckle closu..
SKS Air X Press Floor Bike Pump With GaugeGerman engineered SKS Air X-Press is an affordable..
wizID SLEEK Band This is a SPARE/REPLACEMENT band for wizID SLEEK. Buy this only if you need an extr..
wizID SLEEK TagThis is a SPARE/REPLACEMENT tag for wizID SLEEK. Buy this only if you need an ext..
SKS TOM 18 Mini Bike Tool KitIt’s not okay to be stranded on a long ride just because you weren’..
About Taya 9 Speed Chain TB-90Great shifting: 4-edges chamfered outer plates Gre..
About Taya 10 Speed Chain DECA-101Great shifting: 4-edges chamfered outer platesDurable: DHT..
About Taya Chain Link Connector SC-23 for 8 speed chainFor 8 Speed Chain. No tools required.Spec..
About Taya Chain Link Connector SC-19 for 10 speed chainFor 10 Speed Chain. No tools required.S..
About ELEMENT Adjustable Stem 25.4 (105mm)Meant for 25.4mm handlebar, ELEMENT adjustable stem i..
About ELEMENT Micro Floor Pump GM-71 Mini PumpColor: BlackDiameter: 28.6 mmHeight: 5 mm..
About NUVO Bell NH-B426AP Bicycle BellModel: NH-B426APSize: 34 mmMaterial: Alloy Top wi..
Alligator Golden Bike Lubricant 80ml, HK-LLU05Antirust, easy disassembly.Golden lubricant p..
Sram PG-950 12-23 9 Speed CassetteIf you're a rider whose performance needs or riding style dict..
Sram S600 MTB Bike CranksetLabeling and Finish mesh perfectly with SRAM drivetrain families. For..
Time Xpresso 4 Bike PedalTIME has revolutionized clipless pedal technology and introduces its ne..
Time Xpresso Road Pedal CleatsCafé cleats provide traction so you won't wipe out at the espresso..